Going after a deceased veteran of the Vietnam War and the Senate appears to be creating fractures in Trump's support on Capitol Hill. WASHINGTON — More Republicans are urging President Donald Trump to halt his attacks on the late Sen. John McCain. But Trump is continuing to complain about the Arizona senator's health care vote seven months after McCain died of brain cancer. "I'm not a fan of John McCain," Trump said again Thursday in an interview taped for Fox Business Network's "Mornings With Maria." Two Republicans on Thursday added their voices to a growing chorus calling for Trump to knock it off. "I do not appreciate his tweets. 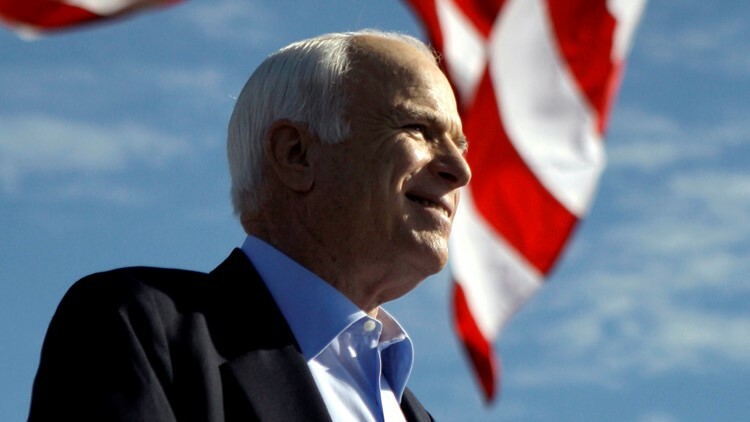 John McCain was a dear friend of mine," Sen. Joni Ernst of Iowa, a member of the Republican leadership and a veteran, said at a town hall meeting Thursday, according to video posted by the Des Moines Register. "No, I don't agree with President Trump. And he does need to stop that." Added Rep. Dan Crenshaw of Texas, a former Navy SEAL: "Mr. President, seriously, stop talking about Senator McCain." Trump has stuck to his suggestion that McCain, a prisoner of war in Vietnam, was not a hero because he was captured. And the president can't seem to forget McCain's decisive thumbs-down that sank the GOP effort to repeal President Barack Obama's health care law. "He was horrible what he did with repeal and replace. What he did to the Republican Party, and to the nation, and to sick people that could have had great health care, was not good," Trump said in Thursday's interview, blaming the media for asking about McCain. In fact, Trump himself tweeted about the late Arizona senator, apparently without provocation, over the weekend. A few Republicans, such as Sen. Mitt Romney of Utah, objected. Then Trump on Wednesday fired back at an official event in Lima, Ohio. "I gave him the kind of funeral that he wanted, which, as president, I had to approve. I don't care about this. I didn't get 'thank you,' he told his supporters. "That's okay. We sent him on the way. But I wasn't a fan of John McCain." Sen. Rob Portman, R-Ohio, who attended the Trump event, told The Columbus Dispatch afterward: "John McCain was a war hero." McCain's family and other allies have ripped Trump for keeping up the commentary. "We only said goodbye to him almost 7 months ago," McCain's daughter, Bridget, tweeted to Trump on Thursday. "Even if you were invited to my dad's funeral, you would have only wanted to be there for the credit and not for any condolences. Unfortunately, you could not be counted on to be courteous, as you are a child in the most important role the world knows." Trump's relentless new targeting of the deceased senator seemed to cross a boundary for several Republicans. Sen. Johnny Isakson of Georgia called Trump's remarks "deplorable." "It will (be) deplorable seven months from now if he says it again," Isakson said on Georgia Public Broadcasting's "Political Rewind" radio show, "and I will continue to speak out."